By Jon Greenberg on Monday, October 8th, 2018 at 11:23 a.m.
Midterms are especially challenging turf for the party in power, and President Donald Trump is on a mission to beat the odds. Trump hit four states in six days last week to boost Republican chances in the Nov. 6 election. He touted the gains on his watch, from record low unemployment to slashing regulations to forging new trade deals. "Exactly five weeks from today, all of this extraordinary progress is at stake," Trump said Oct. 2 in Southaven, Miss. "It is at stake. I'm not on the ballot, but in a certain way, I'm on the ballot. So please, go out and vote." If Trump spurred the crowds with a celebration of winning, he also painted a dark picture of what would happen if Democrats won. 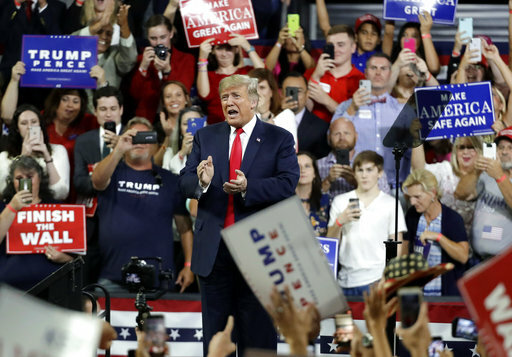 "They want to erase the gains and plunge our country into a nightmare of gridlock, poverty, chaos and, frankly, crime," he said in Rochester, Minn., Oct. 4. Trump’s rhetoric was unrestrained, but if the repetition in each city is any guide, it was hardly unrehearsed. He hit on three hot-button issues again and again. His claims were extreme, or as he put it, "tough." So we decided to match them against the facts. "Democrats in Washington want to raid Medicare to pay for their socialist agenda. They're going to destroy it." This is about bills in the House and Senate to expand Medicare, government health insurance mainly for seniors, to everyone. In the Minnesota rally, Trump laid out his logic. "Their plan is called Medicare for All, except they have no money," he said. "But it's really Medicare for none. Their plan would rob American seniors of the benefits they have paid for." That is Trump’s prediction. But the text of the legislation says something different. "This bill establishes the Medicare for All Program to provide all individuals residing in the United States and U.S. territories with free health care that includes all medically necessary care," the House version says. The bill goes on to list what it would cover, from seeing a family doctor to having surgery to mental health to getting your teeth cleaned at the dentist. Setting aside for the moment whether the plan would be a financial trainwreck, its stated aim is to cover everyone, including seniors. Sticking to literal words, it expands Medicare, not reduces it. The House bill has 123 Democratic cosponsors, about two-thirds of all House Democrats. The Senate version enjoys less support. It has 15 cosponsors, or about one-third of Democrats. Analysts across the political spectrum raise serious questions about the plan’s feasibility. Sen. Bernie Sanders, I-Vt., sponsor of the Senate bill, asserted that a study showed Medicare for All would save the country $2 trillion over a decade. We rated that Half True because the same study also estimated that the plan might increase spending by $3.2 trillion. Democrats have staunchly defended Medicare for decades. The Democratic Party platform calls Medicare "an unbreakable commitment to American workers." In a rally in Southaven, Miss. "Democrats are the party of crime. How does that sound? They're the party of crime. Sounds a little tough, but it's true. Open borders." Trump said every Senate Democrat had signed on to "open borders." "It’s a bill," he said. "And it’s called the Open Borders bill. What’s going on," Trump asked. There is no open borders bill. There is a Keep Families Together Act. It bars federal agents from taking children under 18 away from their parents, a policy launched and then reversed by the Trump administration. We rated Trump’s claim about an open borders bill False. Trump spared no effort to link Democrats to border security and immigrants with criminal histories. "Democrats also support strongly sanctuary cities of death," he said. "Sanctuary cities. Every day, sanctuary cities are unleashing vicious predators and bloodthirsty killers, like MS-13, into our communities. They go out and they hide out in sanctuary cities. Then they come into our cities and our towns." Trump has charged Democrats before of supporting open borders. He leveled the accusation against Hillary Clinton during the presidential campaign. Clinton’s policies told a different story. She backed billions of dollars for border security. She said she would focus on deporting violent criminals and others who posed a threat. To some, Clinton’s support of a path to legal status for Dreamers amounted to an open border policy. We rated Trump’s claim Mostly False. In 2013, Senate Democrats voted for a comprehensive bill that would have delivered $40 billion to strengthen border security. As we’ve reported before, in 2006, 26 Democratic senators including Barack Obama, Clinton and Chuck Schumer voted to build about 700 miles of fencing along the border. Those votes and that level of spending hardly add up to a desire for open borders. "Democrats want to raise your taxes." Trump asserted that Republicans are the party of tax cuts, and Democrats are the party of tax hikes on the average guy. The Democratic position is not the middle-class attack Trump described. Democrats do talk about raising taxes, but their proposals target the wealthy and corporations. Schumer put forward a $1 trillion dollar infrastructure plan financed by "closing tax loopholes used by corporations and super wealthy individuals." Schumer’s plans includes raising the corporate tax rate from 21 percent to 25 percent and raising the top tax bracket back to 39.6 percent. In terms of direct impacts, such changes would spare the typical household. House Minority Leader Nancy Pelosi, D-Calif., was accused of saying Democrats would raise taxes if they regained power in the House. What she actually said was that Democrats would aim to undo the Republican tax law and rewrite it –– in consultation with Republicans. "We’ll sit down at the table and say ... what would be a tax bill that creates growth, that creates good paying jobs as it reduces the deficit?" she said. "It’s not about chipping at this piece or that piece, it’s about a comprehensive look at what our tax policy should be for the future." Pinning the tax hike label on Democrats is familiar fare in the midterms. We’ve seen it in North Carolina, West Virginia, and other states we’re tracking this election. In a rally in Rochester, Minn.